Once opened, the FRED PA-1 guides the rescuer step-by-step during the entire resuscitation process. 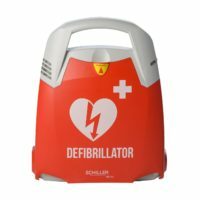 Dedicated to public access, SCHILLER’s latest defibrillator, the FRED PA-1 has been designed so that even untrained users can save lives. Defibrillation, in more simple terms, is the act of delivering electrical energy to the heart in order to restore a proper heart rhythm. In an emergency situation, such as cardiac arrest, a defibrillator in combination with well-performed chest compressions is the only therapy that can save a patient’s life. When you lift up the device cover, the FRED PA-1 starts up immediately. The electrodes are pre-connected: apply them to the patient’s chest and let the FRED PA-1 guide you. Resuscitation Guidelines emphasise the importance of minimising the time-to-shock after Cardio Pulmonary Resuscitation (CPR). In order to reduce the hands-off time (time while no CPR can be performed), the FRED PA-1 features a fast analysis system that systematically pre-charges the correct energy so that the shock can be delivered as soon as it is recommended. Not only is the FRED PA-1 intuitive with simple 1-2-3 steps, but it also features spoken instructions and clear imagery that also guides the user through the process. Should you have missed information given by the device, don’t worry: just push the “Repeat” button to listen again to the last instruction. The electrodes are pre-connected: apply them to the patient’s chest and let the FRED PA-1 guide you. The FRED PA-1 automatically performs regular self-tests and indicates whether or not the device is ready for use. When a check is necessary, the FRED PA-1 provides warnings: acoustic signals as well as LEDs indicate the state of the device and the actions that have to be taken (replacing the battery, the electrodes…). Perfect for an international environment. The three available languages can be customised at the time of order. With its high IP rating (IP55-protected against dust and water projection), the FRED PA-1 withstands even unfavourable conditions. The FRED PA-1 can store up to 2 hours of intervention data, including 500 events. Using a simple SD card, the retrieval of the intervention data as well as the software update are very easy to perform. SCHILLER provides peace of mind with up to 10 years of warranty—in the case of a warranty, the device is replaced with a new one. The FRED PA-1 has a long battery life (6 years) in order to be ready the day you need it. Battery level is checked during the self-test and a LED warns of low battery level. Thanks to a highly innovative feature, the device is able to determine when the shelf life has expired and prompts the user to replace the electrodes. Used with adult or children electrodes, the FRED PA-1 automatically recognises the electrode type and adjusts the defibrillation energy accordingly. At the back of the device, a set of children electrodes can be safely stored. Defibrillation is not enough. In order to keep bringing oxygen to the organs, the blood flow must be kept. This is the purpose of chest compressions, and the reason why it’s important to do it right. The FRED PA-1 helps you to correctly perform chest compressions by indicating the right positioning and setting a regular rhythm (metronome) in order to achieve the highest efficiency possible. Note: All EMR SCHILLER AEDs (Defibrillators) are GST Exempt Under GST Act Schedule 3 and subsection 38-45(1) Exemption Code GSTE=B1. The FRED PA-1 comes with a 10 Year (120 months) Warranty from the date of your order. Emergency Medical Response are a Authorised InterMed Medical Pty Ltd distributor. Proceeds from the sale of EMR First Aid KITs and AEDs help fund our FREE Community Emergency Medical Response Services. We can also train your workplace or members of your local organisation, club or association when we deliver your defibrillator. Ease of use: interface with 1-2-3 steps – Not only is the FRED PA-1 intuitive with simple 1-2-3 steps, but it also features spoken instructions and clear imagery that also guides the user through the process.